This is such a perfect verse for a new year! Thank you for sharing! My husband loves new beginnings - new days, new weeks, new months, new years. Praise God that He made us new creatures in Christ! Precious in both word and photo! Have a blessed Sunday! I know I share many deer photos, but they are precious! These 2 were just outside our sliding doors looking in at me - probably wondering when the bird feeder was going to be refilled! You have just made me find the goodness in snow all over again...it makes things new! I'm glad God sees me as new and improved all the time instead of the grumble I tend to be more often than not. Our lake effect snow machine has been cranking out the white stuff almost continually for a month, and I love that things are pure and white every morning. (These bone-chilling temps, however, I can do without!) 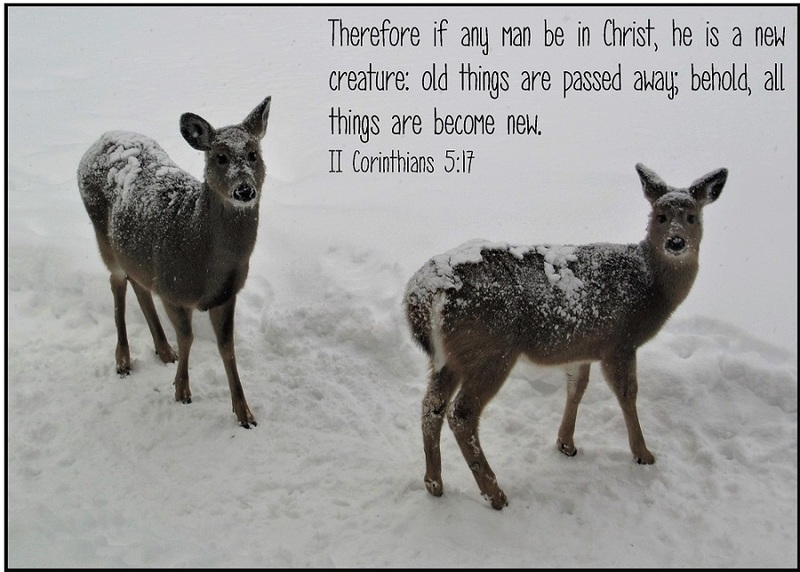 Isn't it wonderful to be a new creature in Christ? As you said - God sees us as new and improved! Beautiful. The Scripture and picture. Thanks, Debbie. I love it that God made deer so beautiful and sturdy. They didn't seem a bit bothered by the snow crusts on their backs. Thank you, Pat. Stay warm and joyful! I love this photo and the promise contained in this verse! I think the challenge is to let go of those old things and let the new take root. Hard to take a bad shot of these 2. They're almost pets. What a nightmare, Bev! My husband and I have both committed to prayer about your situation, and I ask any others reading this to please make mention of this in their prayers, too. Please send me a note after God answers to let us know the problem is resolved. Keep looking up! I love this verse. It seems to hold so much promise and so much responsibility. What a great observation! Thank you! Bev, thanks so much for sharing this today! Oh yes, been there, done that repenting of a bad attitude thing - unfortunately more times than I can count! It is amazing how we take things like hot running water for granted when so much of the world isn't afforded that blessing. Your answer to prayer brought tears to my eyes this afternoon. It's so wonderful when we see God answer big prayers, little prayers and everything in between! I am honored that you and your husband down in NC would make mention of our needs to the Lord in prayer. What a blessing that is to us! I guess I always hesitate to mention our own health issues on the blog, but I do have some positive updates to share soon. I agree - Proverbs 3:5,6!